I was just looking through my recent blog posts, and I realised that it has been a while since I did a cake post. 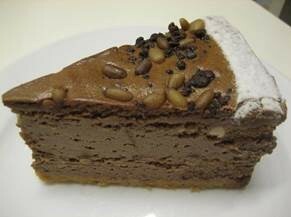 So here is a gorgeous coffee cheesecake that has caught my eye. Creamy, indulgent – and best of all, easy to whip up – this is the dream dessert to impress a date, treat your friends or enjoy yourself. With a crisp, crunchy biscuit base, and smooth, creamy filling, this cheesecake requires no baking to prepare. Create a base with 250g of ready-made biscuits – oaty digestives give a wonderful, chewy texture, while chocolate digestives or bourbon creams give a chocolate hint that complements the coffee flavour. Break the biscuits into crumbs in a food mixer and add 100g of softened butter. Mix them together well, and spread out across the bottom of a medium sized cake tin. Leave in the fridge to firm up. Meanwhile, you can put together the cream filling. Whip 300ml of double cream until stiff peaks form, and gently fold in 500g of soft cheese – a creamy cheese like mascarpone is a winner. To give it a coffee-flavoured boost, use freshly brewed coffee –Tassimo coffee pods work really well for this. A tablespoon of coffee is perfect for a mild coffee taste, but if you want to give it a stronger punch, don’t be tempted to simply add more coffee. Instead, use a stronger, more concentrated brew. Mix the coffee gently into the cream mixture. Once the cream filling is whipped and evenly blended, spoon over the biscuit base and smooth over until level. Return to the fridge and allow to firm up for at least an hour before serving. Slice and serve. First, prepare the pan for easy removal. This tip will help you avoid the awkward, crumbly mess of biscuit crumbs when you try to extract your cake from the tin. Just line the baking tin with cling film or aluminum foil, placed around the base, with an overhang at the top, of at least an inch. When it’s time to serve the cake, simply loosen the cake from the tray by pulling gently at the edge of the foil, and lift out gently. This cheesecake can also be frozen to be served at a later date. Make up the entire cheesecake and once complete, transfer it into an airtight container before freezing. Allow to defrost slowly overnight in the fridge. You can enjoy individual slices, or defrost the entire cake, but do not refreeze it again. And there you have it. The perfect dessert to keep you going through these dark, wintry nights. Give it a whirl today! This sounds delicious. My husband absolutely loves coffee flavored anything so I will have to try it. Ohh, I really love that cheesecake, it must taste heaven! anything with a coffee taste just works for me and this is something that I am goign to make over the weekend. Thanks a lot for haring the tips and the easy to follow recipe.